I’ve read this book recently and it was absolutely amazing. 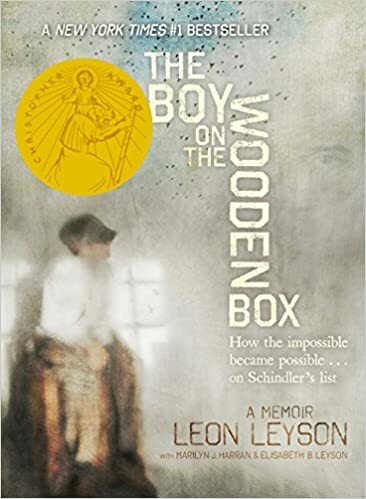 It is a memoir from Leon Leyson, who was one of the youngest survivors of the Holocaust because of the Schindler’s list. The boy was only 10 years old when Nazis invaded his country, Poland. He and his family were living in Narewka (in the northeastern part of Poland) and he was the youngest of 5 children. His father had a job in a glass factory which relocated to Krakow so he had to move there and after a while he took his family there too. When the war started his father went to work in Schindler’s factory. After a while Leyson and his mother were taken to the camp in Plaszow and they were separated. Here he lived alone, in fear. Eventually his father manage to get the boy’s name and his mother’s name on the list of thirty Jews to be added to Schindler’s business. The Leyson family survived under Schindler’s protection. After the war Leon moved to America and finished his education after being in the Army. He became a teacher and taught for 39 years. The book is an easy read and it was written for young people, but not only. It is a really moving and heartbreaking story, which should be read by everyone, of any age.